Another gem from LAFCO, Golden Chestnut is quite exceptional. It’s in a light amber tinted glass with a slight iridescent shimmer, it’s very striking. So, truth be told, I’m not a big fan of gourmand fragrances. I know, I know, so many people are, and particularly this time of year, gourmand candles are literally everywhere. But that being said, Golden Chestnut isn’t just another gourmand candle, and I LOVE it!! I must admit, I do have a special place in my heart for Chestnut, probably because way back in the day, I created the Illume Roasting Chestnut candle. It was based on my experiences of living in Italy and around the holidays the streets would fill with the fragrance of roasting chestnuts, and as we all know fragrance = memories. LAFCO’s Golden Chestnut is as all of their fragrances tend to be, sophisticated. In the description they call it a “Savory Gourmand” which to me calls out the deep exotic spices that make this gourmand candle something very special. The full description reads “A fresh aromatic blend of balsam, pine needles and exotic spices are highlighted by tangy lemon zest for a seasonal embrace. Warm chestnuts and hazelnut cream create a tantalizing presence at the heart, while white cedar, cistus, patchouli and vetiver provide depth. Vanilla sugar adds an extra sweet sparkle”. Well, there you go, that isn’t your average gourmand candle, this is exotic, complex and refined. Side note: If you missed our blog post The Thanksgiving Table, we talked about scented candles and food, I see this candle as one that could be burned in the same room as a holiday meal. There you have it. I can no longer claim to not be a big fan of gourmand candles! Feu de Bois Limited Edition – Smoky frankincense blankets cozy notes of leather, sandalwood, and pine. Crimson Berry – Crisp lemon and orange create an inviting opening for this exhilarating scent inspired by shimmering red seasonal berries. Winter Balsam, a refreshing, cool pine with notes of oud. Pumpkin Pomander – An inviting mélange of ginger, cinnamon, nutmeg, cardamom and clove are accentuated with mandarin for sparkle. 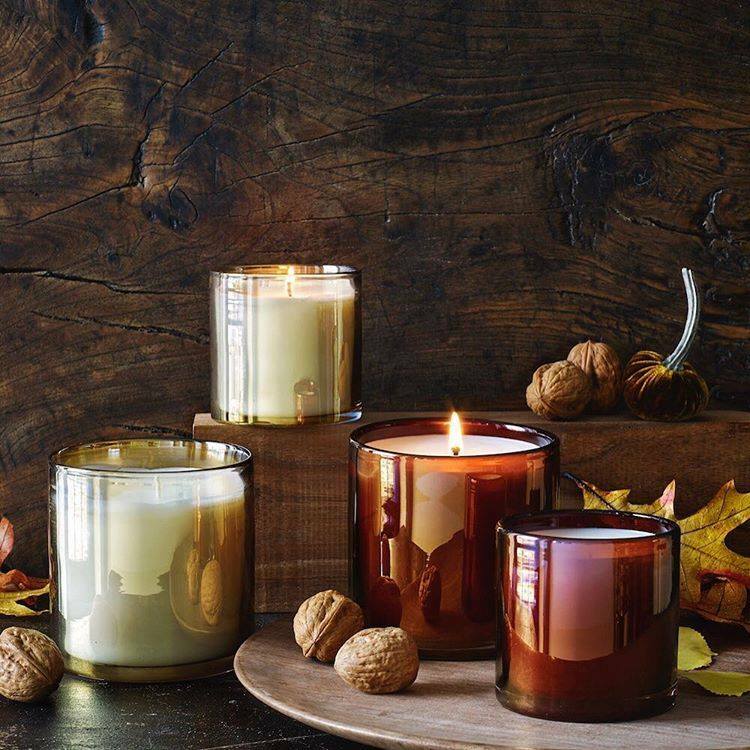 Explore LAFCO Seasonal for a luxurious holiday this year!